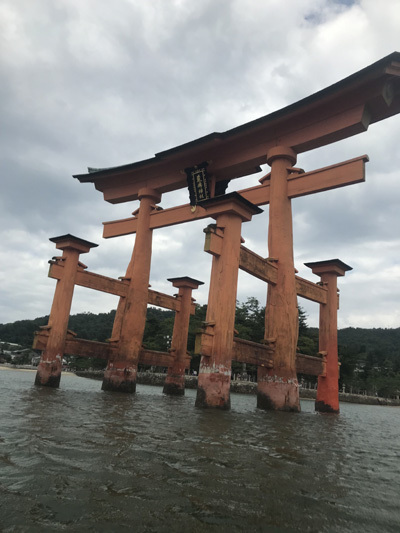 After taking in the metropolitan sights of the Tokyo Bay coastal area, take a journey to the Itsukushima Shrine, a World Heritage Site floating in the sea. 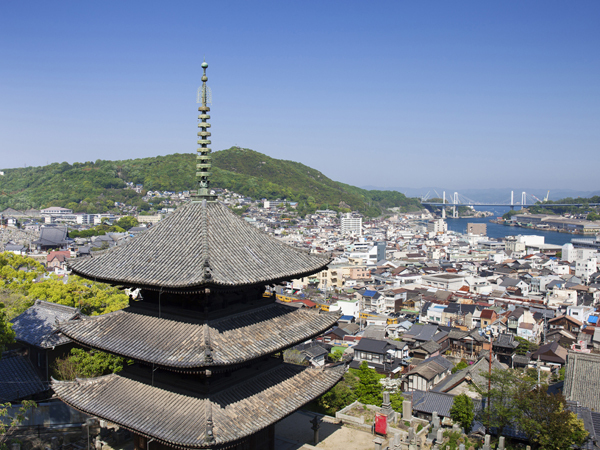 Then head to Onomichi, at the crossroads of the Seto Inland Sea. 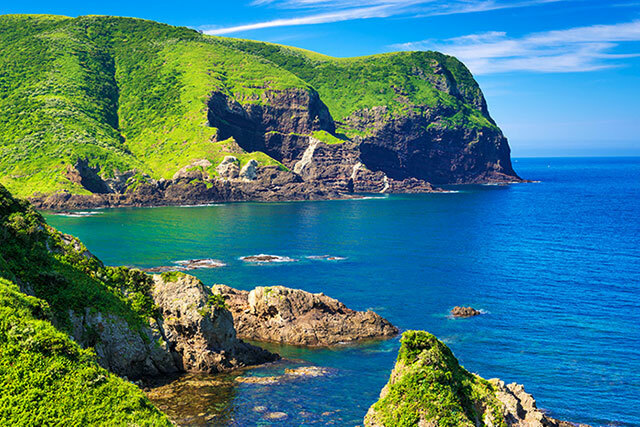 A trip to experience a Japan encompassed by the sea as the gentle ocean breeze blows around you. 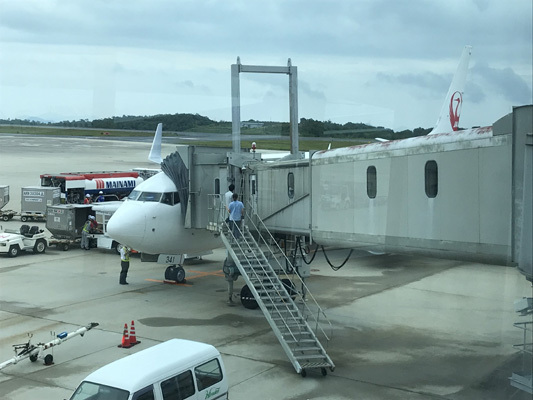 I am always thankful to JAL with its generous service. The seat is comfortable with a lot of legroom, which enabled a relaxing journey to Japan. 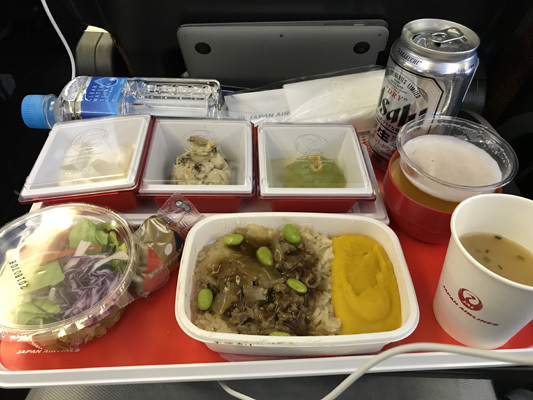 As far as the meals go, I'm always impressed by the food provided by JAL, being nutritious and tasty. 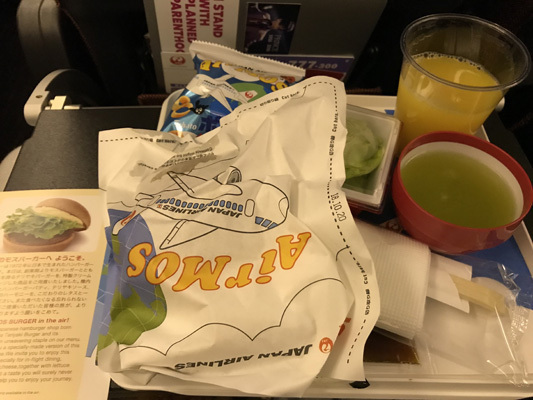 Also, the inflight "Mos Burger" was a neat surprise! I overheard some American tourists sitting across the aisle who were wondering what kind of burger it is. One of them said: "I don't know, but it's good!" 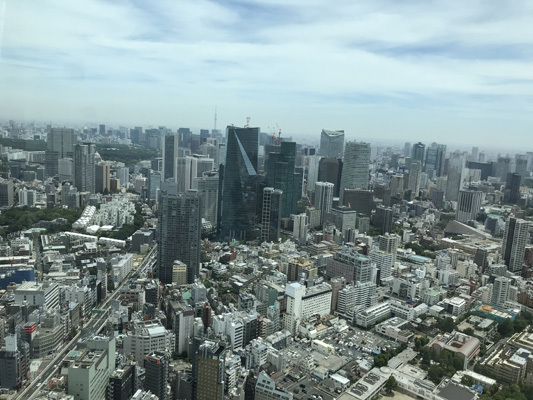 Although I had previously lived in Tokyo, I had never been up to the observation deck of Mori Tower, so this was a really cool experience for me. 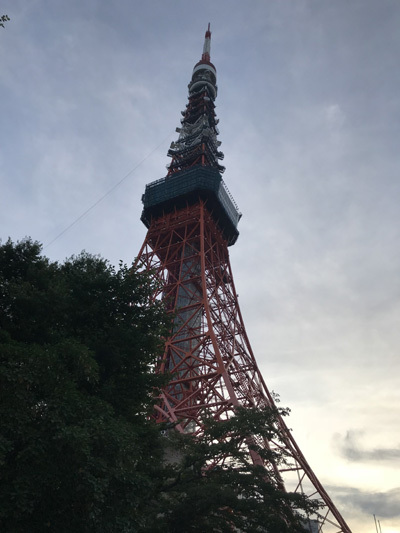 I also enjoyed our guide's commentary at this time, because she explained in detail about the architecture of Tokyo and the history of all the different buildings. 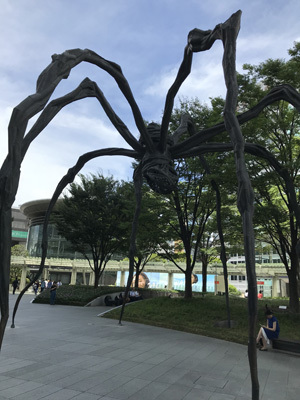 I had been to Roppongi Hills before, and again I had a nice time there. I enjoyed the Mouri Park especially, as it preserves a little bit of ancient history even amid this very modern corporate development. A nice sign of Japan's emphasis on balancing the old and the new. 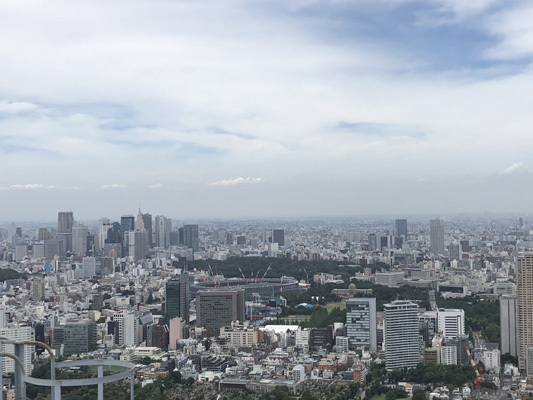 Going up to the Tokyo City View at Roppongi Hills' observatory deck to take in views of Tokyo was really nice. 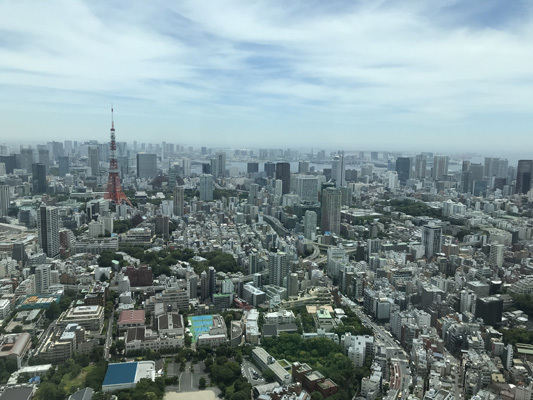 We learned about the history and architecture of Tokyo while looking across the city. 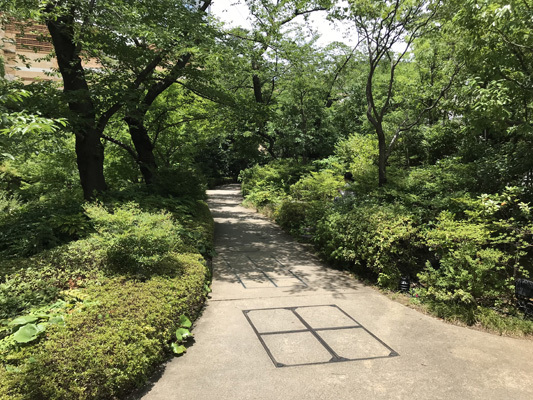 I enjoyed wandering around the garden near the television station. Learning the history of this place in detail was quite interesting. The lunch at Kakiyasu was delicious! 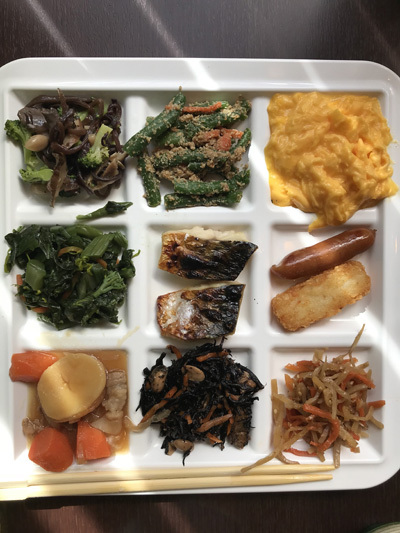 I enjoyed the variety and the meticulous preparation of all the different plates. The mochi for dessert was also a nice touch. Stopping by the limited-run highball garden in Roppongi Hills was a nice break early on. 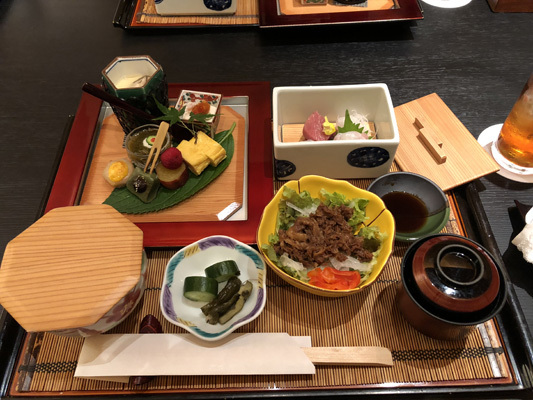 Even better was lunch in Ginza; the atmosphere of the restaurant was very traditionally Japanese, and offered a serene place to enjoy a tasty meal. 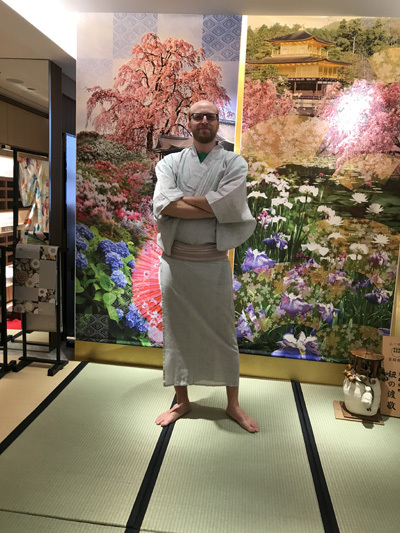 It was nice to try on a traditional Yukata and see what it feels like. 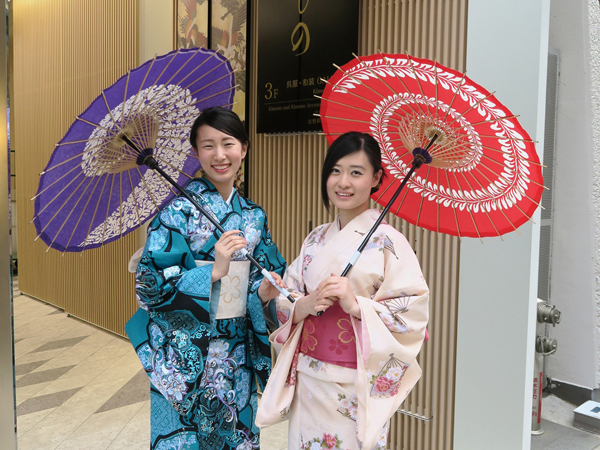 We walked around Ginza with our Yukata and Geta, which was quite an interesting experience. I think this would be fun especially for women. 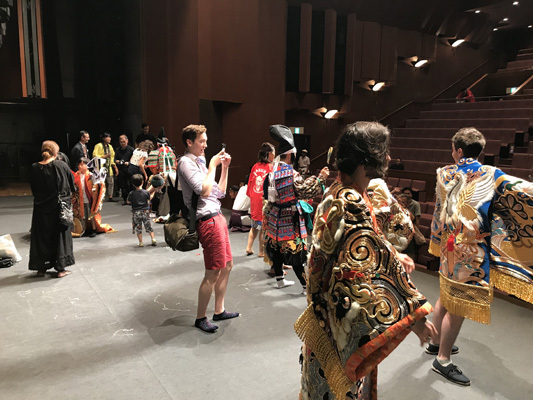 I enjoyed visiting the museum at Kabuki-za and learning about all the centuries-old costumes, performance techniques, and stage props of kabuki, and how the art stayed faithful to its roots despite the rapid modernization of the 20th century. The staff at the store were very helpful. 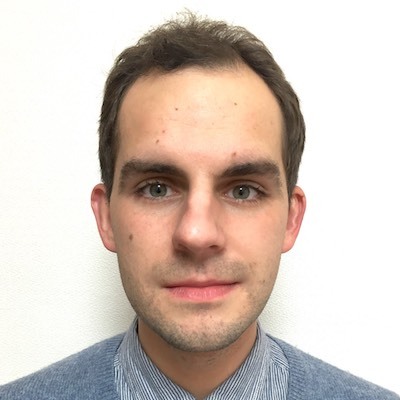 Walking around Ginza in yukata drew a lot of attention, but it was a very interesting experience. Walking through Ginza led to the Kabukiza Theater and the Kabukiza Gallery, which were really fun. 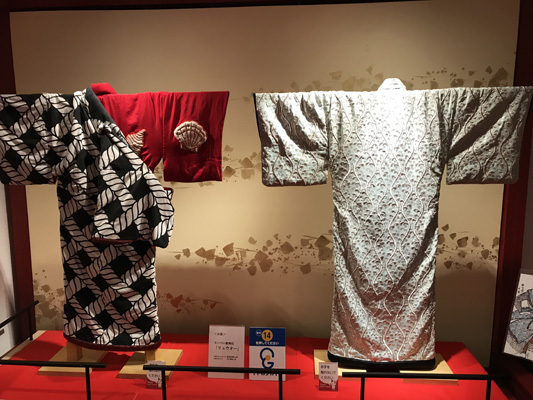 I really enjoyed all the information and displays of the Japanese tradition's costumes and props. This was really cool! 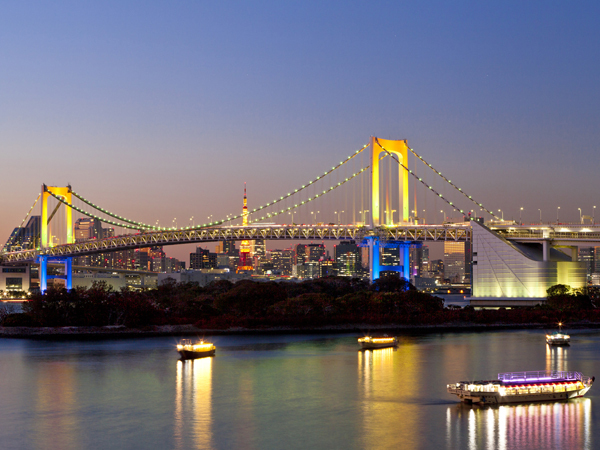 I liked the sensation of breezing around Tokyo in the cool evening air, seeing the sights of the city lit up around us. 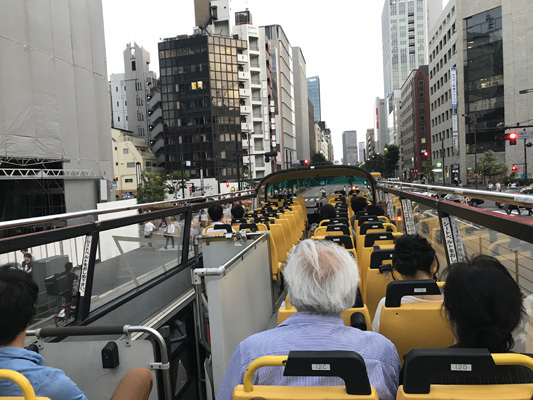 The route takes you near landmarks like the Tokyo Tower and Rainbow Bridge so it's a great photo opportunity, plus the fact that the bus departs in the late afternoon and arrives back after sunset means each leg of the trip offers a different kind of experience. Would definitely recommend this, especially for first time visitors. 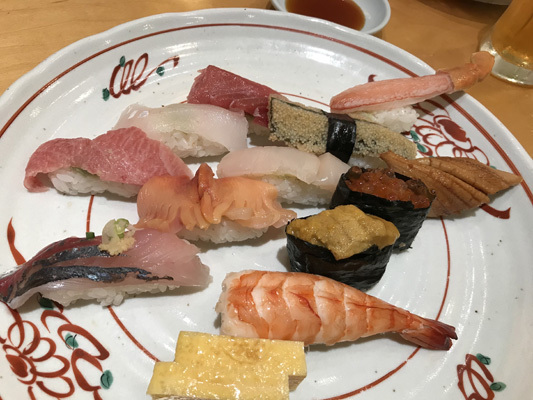 We had an opportunity to have dinner in Odaiba during our Skybus route, and enjoyed a nice sushi dinner at Sushiko. For a sushi restaurant, they have a variety of different options on the menu, so there's something for everyone. I've always wanted to go on the Sky Bus, so I was really excited to ride as part of the day's activities. 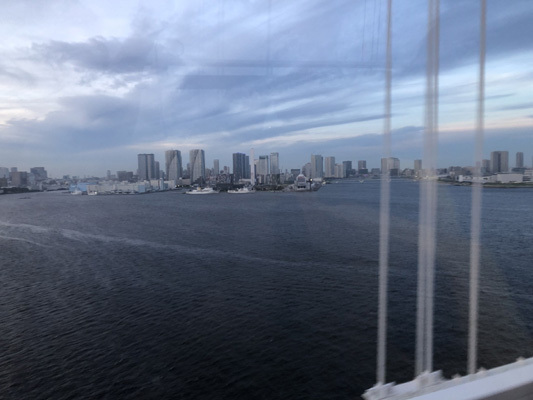 It did not disappoint, as the views provided were quite beautiful — particularly the close ups of Tokyo Tower and the entire cityscape from the Rainbow Bridge. 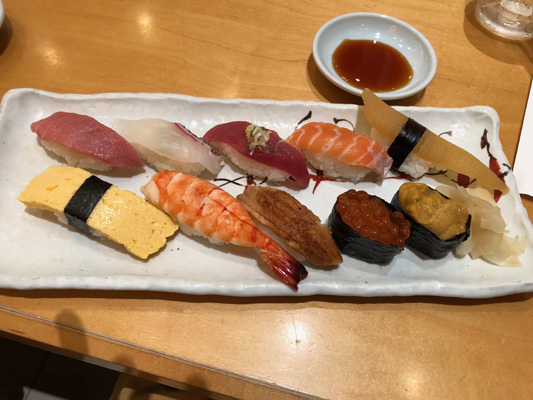 The sushi at the restaurant in Odaiba was tasty, and there was a good amount of variety, meaning I could feel quite content from one order and not feel like I had missed out on anything at the conclusion of the meal. 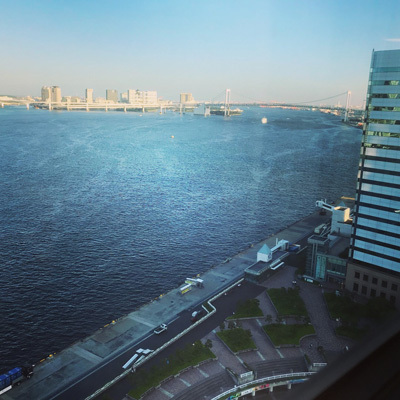 Takeshiba is not an area of Tokyo I had stayed in before, but it was quite scenic and pretty, with a view from my room overlooking the bay. The room was comfortable, and the breakfast was great! 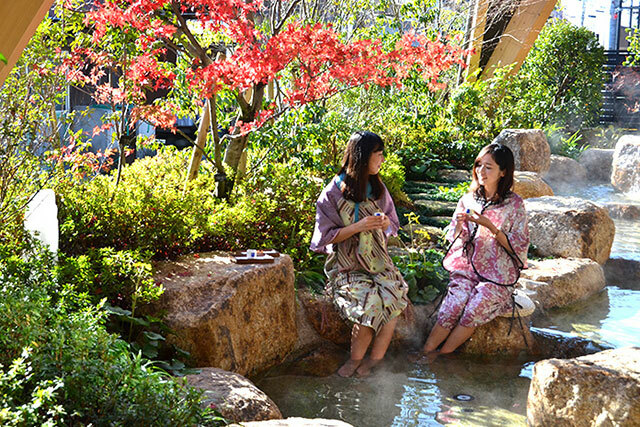 I also enjoyed the bath area (tenkuu-no-yu). Not sure I've ever been so impressed by a hotel view as much as I was by the one here. 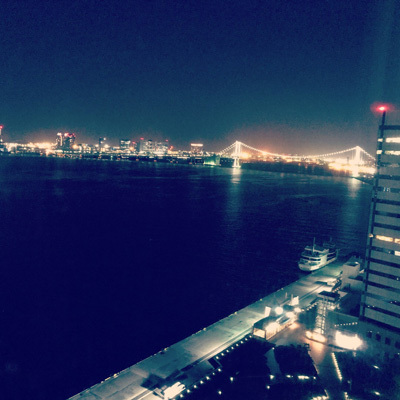 Being able to see Tokyo Tower from my room was a nice perk to an already great room that offered plenty of space and comfort. The bath and sauna were another pleasant touch that felt incredible after a long day on the town. 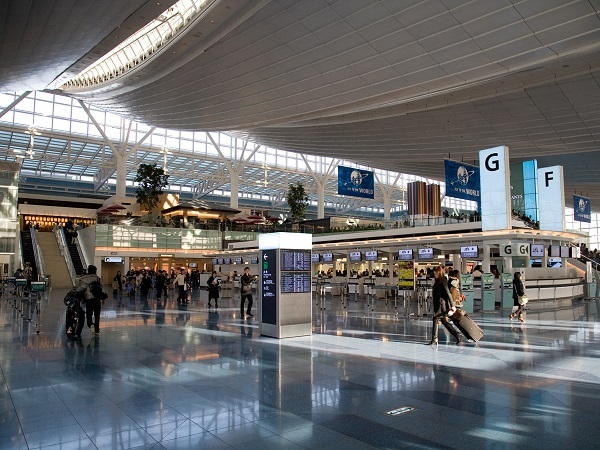 Flying in and out of Haneda is always a breeze. It's so close from central Tokyo and conveniently located. I also appreciated how smooth the check-in and security process was, with short and fast-moving lines. The JAL service attendants were all very nice, and the economy class seats had plenty of leg room that I could relax. 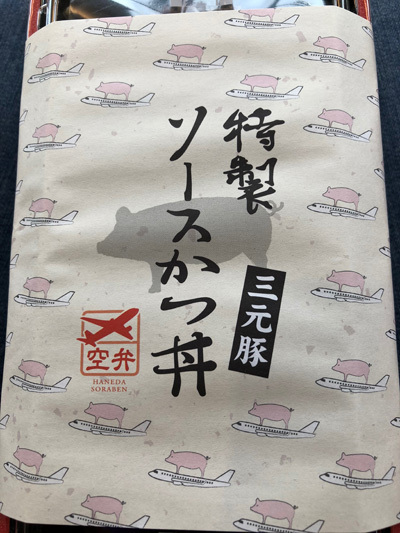 There were so many types of delicious "sora-ben" at the airport to choose from, that it was hard to make a decision! 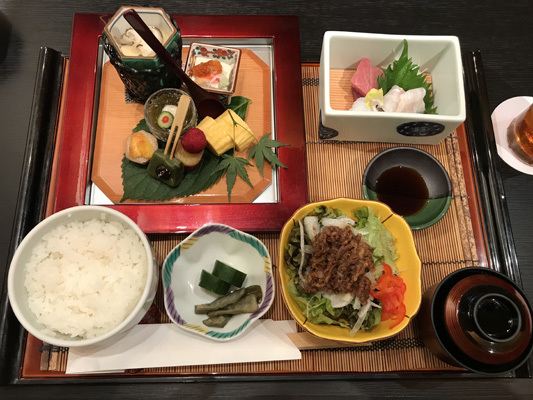 I really appreciate this about traveling domestically in Japan, there's always a wide variety of good, nutritious, reasonably-priced food to choose from. Checking in was a breeze from Haneda, as all I had to do was scan a QR code. The process of going through security and boarding the plane was very easy, and the flight was on time. 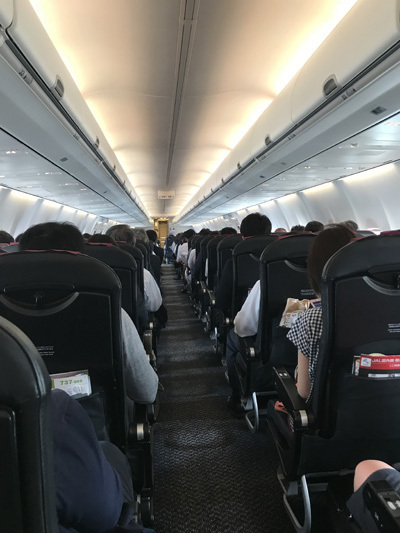 The seat was comfortable with enough space that I was able to rest toward my visit to Hiroshima. On the flight to Hiroshima, I was able to choose a bento for the plane from an extensive selection at Haneda Airport. 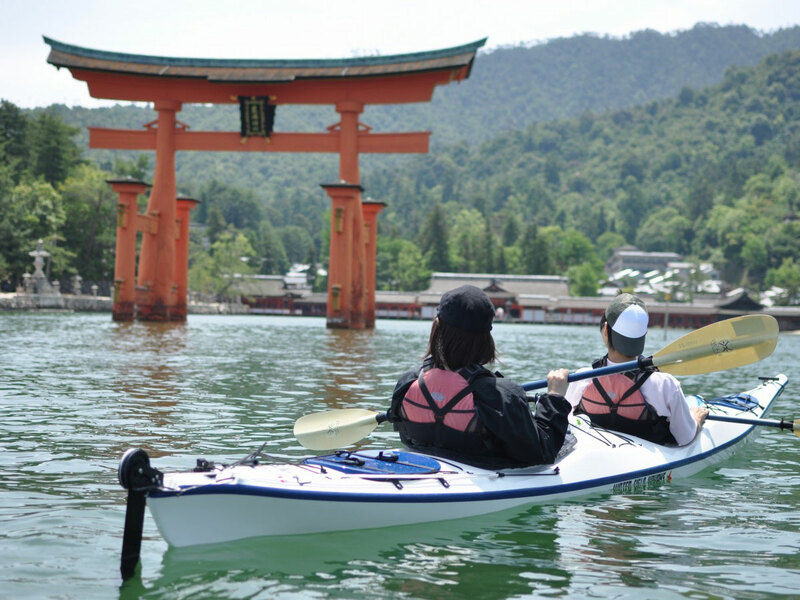 Sea kayaking is a fun water activity for exploring the calm waters of the Seto Inland Sea. You can get close to Itsukushima Shrine and also pass under Miyajima’s grand torii gate in the water. Rentals are available for all the necessary equipment. Beginners are also welcome after a small amount of practice, making sea kayaking an easy and fun activity for all. 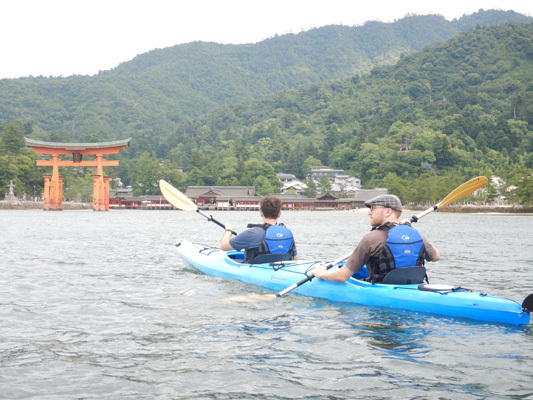 The sea kayaking at Itsukushima Shrine was one of the highlights of the trip for me. 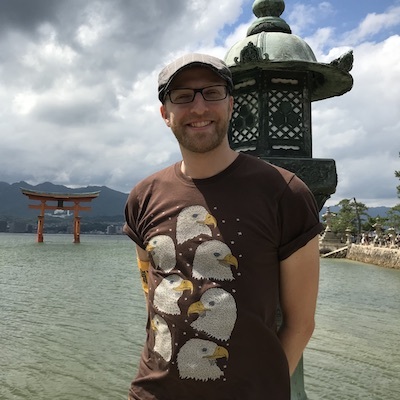 A very memorable experience, and very cool to get such a close-up view of the big Torii (we actually went directly through it)! 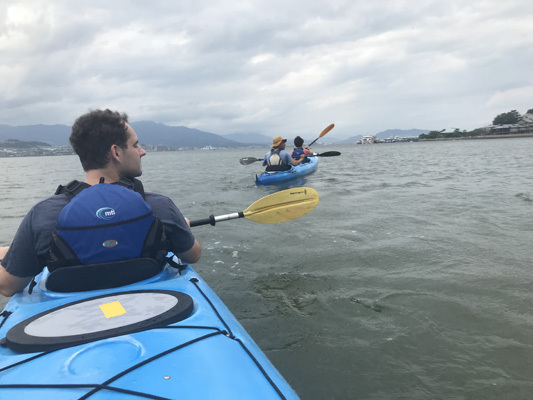 Our kayaking instructor was also very kind and patient, which helped us to relax and just enjoy the calm, peaceful experience of being out on the water. 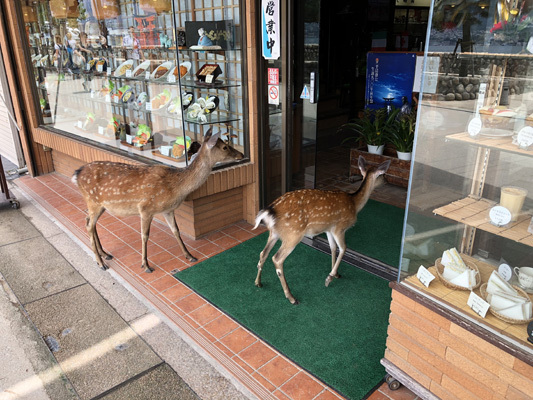 Miyajima is such a lovely little town, and the deer are so cute. 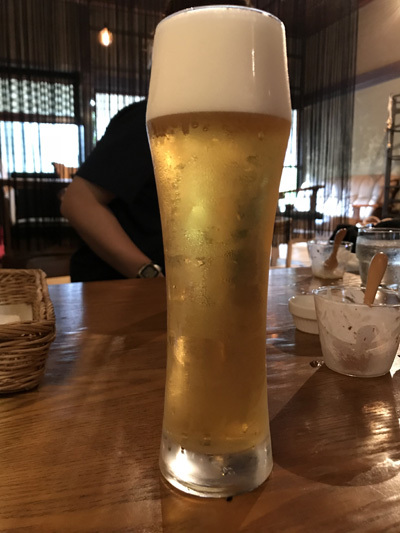 I enjoyed walking around the town with all the shops on the street leading up to Itsukushima Shrine, and the beer at Miyajima Brewery was really tasty! 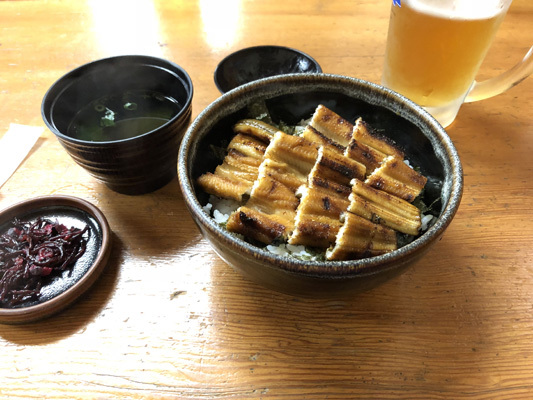 The anago-don in Miyajima was SO GOOD. One of my favorite meals of the trip! I liked the old-timey atmosphere in the store, too. And of course, the okonomiyaki in Hiroshima was delicious too. It was pretty fun on this trip to be able to experience a wide variety of transportation, including ferries and streetcars! Everything ran punctually, efficiently, and safely. I had not been kayaking in about 10 years, so I was slightly nervous before this one. However, the people renting out the kayaks were incredibly kind, and their instructions were very clear. 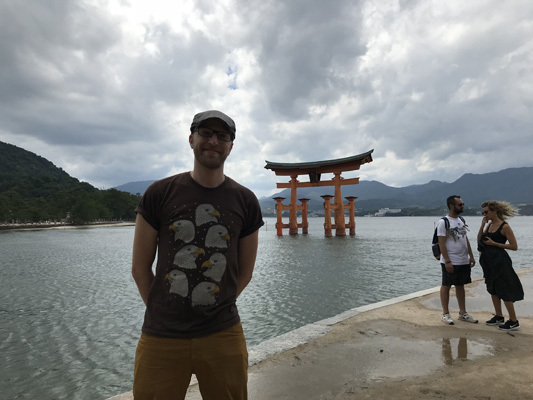 Being out on the water was peaceful, and having the chance to get an up close look at Itsukushima Shrine felt special. 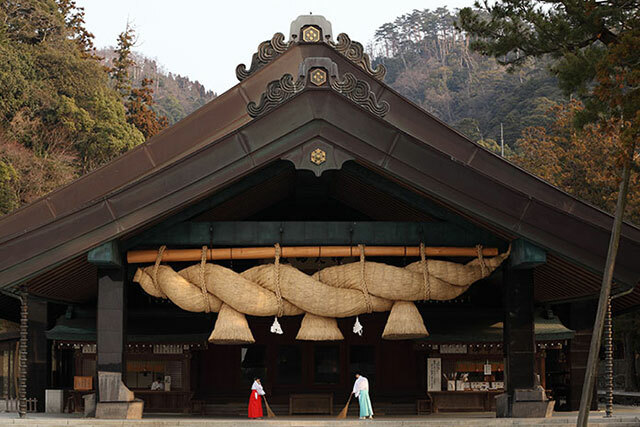 Miyajima was fantastic, and this trip allowed me the chance to learn a lot about the island. 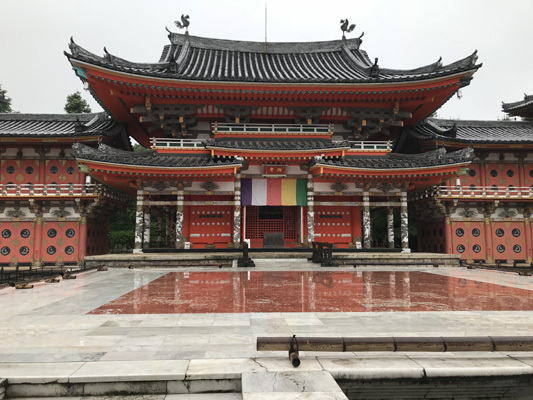 I liked heading up to the Daisho-in Temple on the mountain and learning the details about what the buildings and statues represented. I enjoyed Itsukushima Shrine even more because of the backdrop of the sea. Just walking around the shopping areas and beachside streets of Miyajima was a great experience. Just a fantastic variety of food. The lunch of anagodon (conger eel on rice) was really high quality. 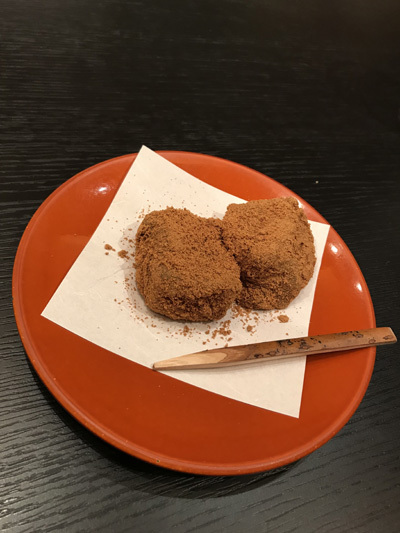 I was glad there was time to visit Miyajima Brewery, and also eat momiji manju (sponge cake in the shape of a maple leaf). Dinner was Hiroshima-style okonomiyaki (a savory Japanese pancake) that was delicious. 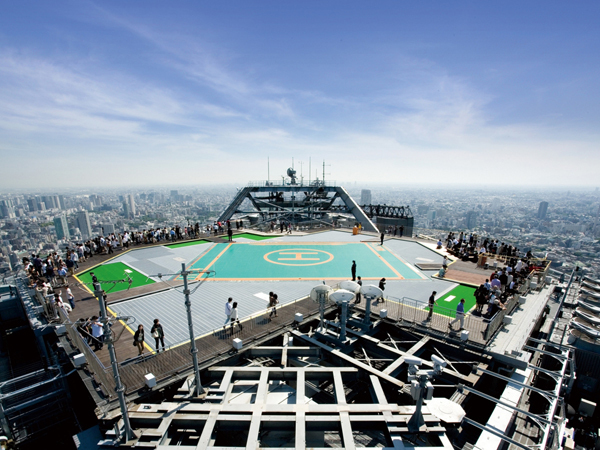 I also liked visiting the new tower complex called the Orizuru Tower near the Atomic Bomb Dome. 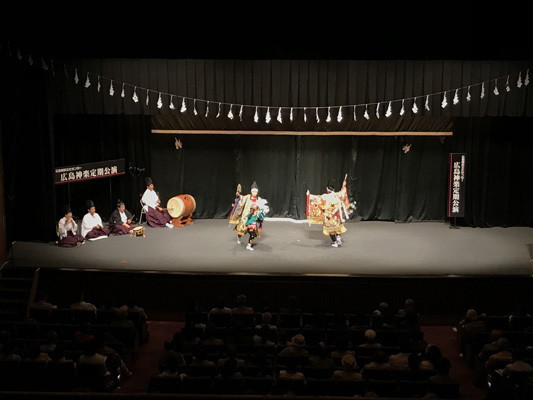 A kagura (traditional Shinto dance) performance was a nice way to end the first day in Hiroshima. It was interesting to watch a performance and pick up on the little details of this art form. 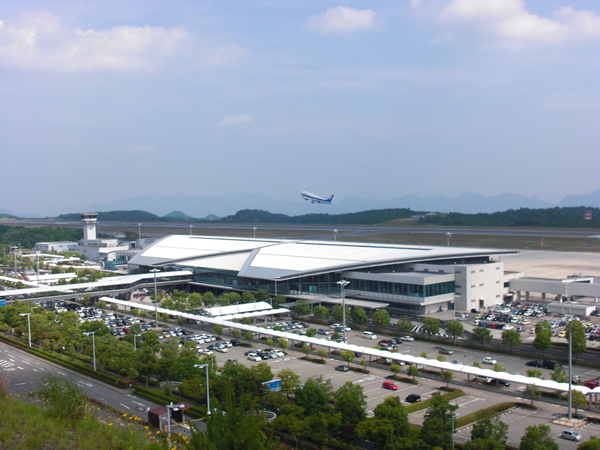 All transit in Hiroshima and the surrounding area operated smoothly. The train to the dock for Miyajima was pleasant and offered many really nice views of Hiroshima. 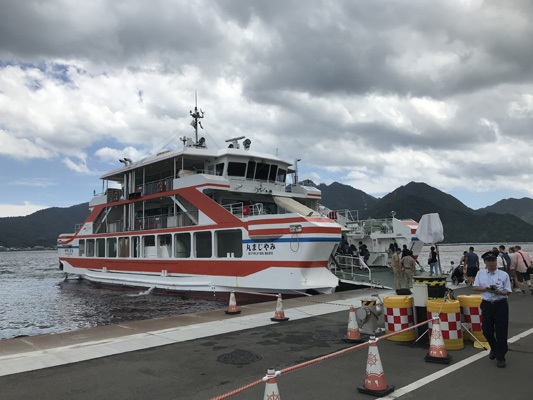 The ferry to Miyajima, meanwhile, was punctual and pleasant, offering excellent looks at the shrine on the island approach. 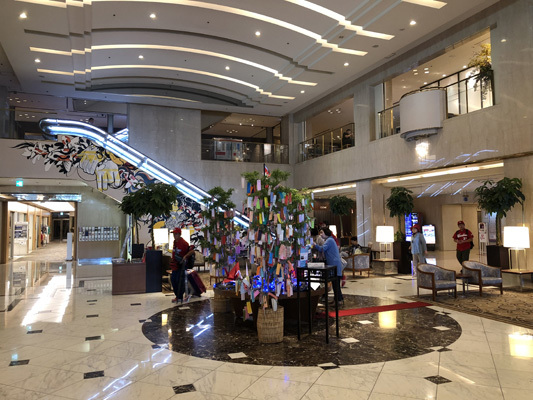 Hotel Granvia Hiroshima was a great hotel. Very comfortable beds in the rooms, impeccable service, and tasty breakfast. No complaints whatsoever. The proximity to Hiroshima Station was extremely convenient. The room was very comfortable, offering ample space. I also liked the small touch of them providing a morning newspaper to catch up on the news. Additionally, Hotel Granvia Hiroshima offered up a really nice breakfast buffet to help start the day right. 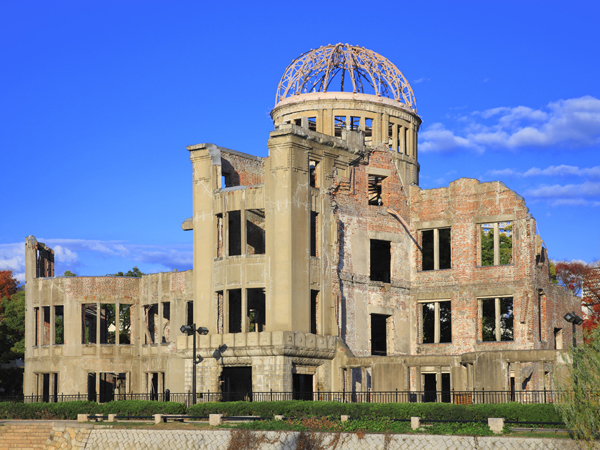 Hiroshima Peace Memorial Park is a large park established in the heart of Hiroshima near the center of the atomic bomb blast in hopes of sustained world peace. 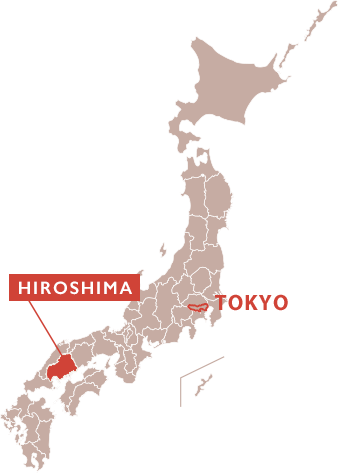 The park includes a number of points of interest such as the Hiroshima Peace Memorial Museum which documents Hiroshima in the time of the bombing, the Hiroshima Peace Memorial, or Genbaku Dome, the cenotaph of bomb victims, the Hiroshima National Peace Memorial Hall for the Atomic Bomb Victims, and International Conference Center Hiroshima. 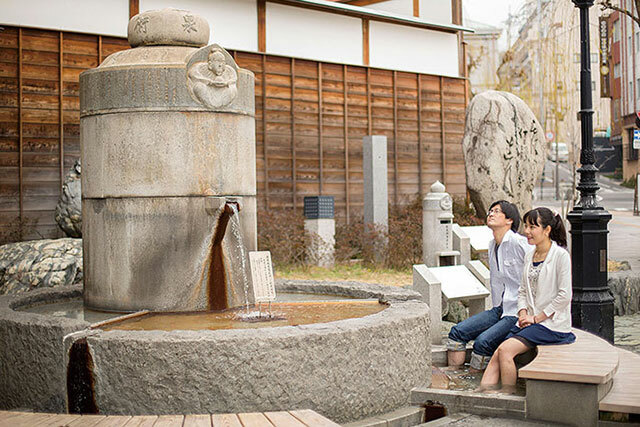 The Hiroshima Peace Bell that is rung in hopes of peace on Earth is designated as one of Japan's top 100 soundscapes by the Ministry of the Environment. 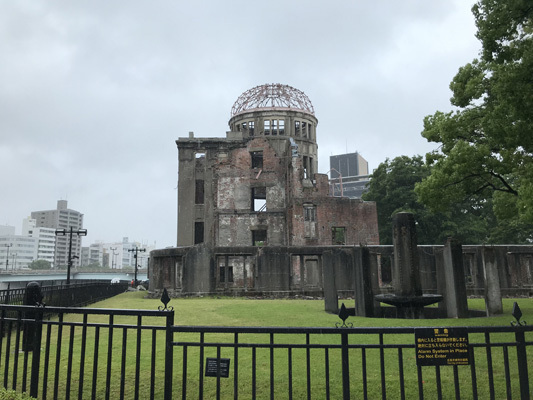 The last time I actually had a chance to go inside the Hiroshima peace memorial and museum was when I was 14 years old, so I appreciated the opportunity to revisit this important site as an adult. It's a sobering experience, but I think it's a place that everyone should visit at least once in their life. Unfortunately due to the heavy rain, we were unable to experience the "city of rivers" via the gangi taxi, which was in our original itinerary. However, the boat driver came to meet us at a riverside coffeeshop, and we had a chance to chat about the river taxi system, which was interesting. 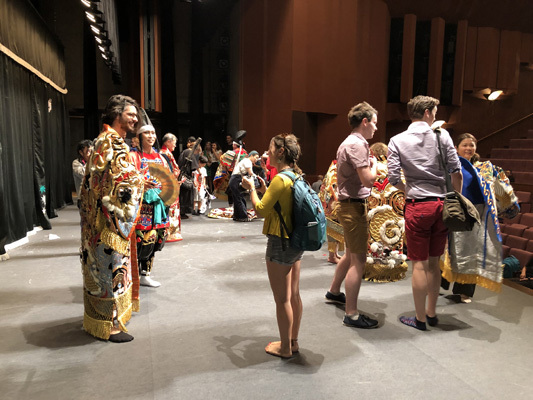 I especially like learning about the history of the gangi, and the important role they play in the lives of Hiroshima residents. I will definitely keep this in mind for future trips to Hiroshima. 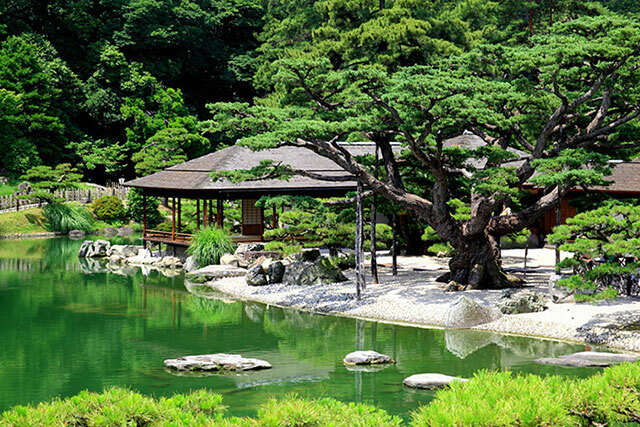 Shukkeien Garden was very peaceful and relaxing. I liked the lush greenery, the blooming hydrangea flowers, and the stillness of the pond. 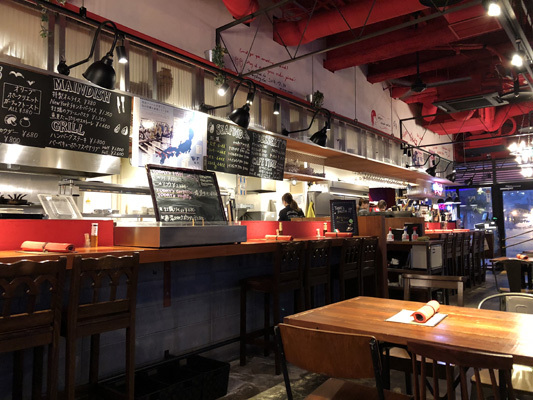 If I lived in Hiroshima, I think I would try to come here pretty often. 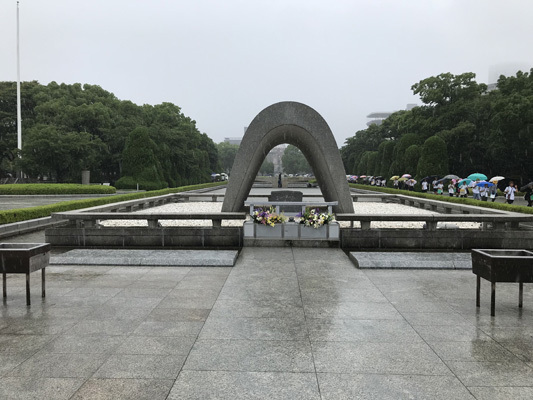 The region began to experience heavy rains the day we were to visit the Hiroshima Peace Memorial Park. 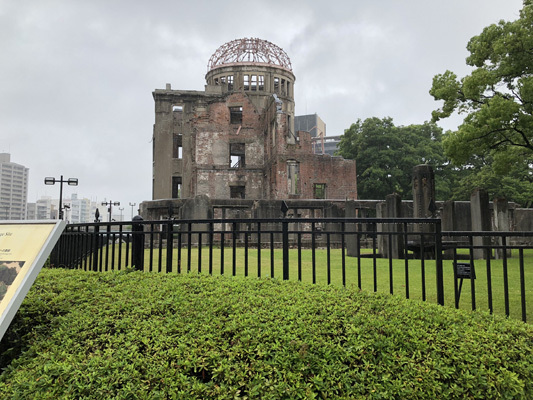 The Hiroshima Peace Memorial Museum was a somber experience, which is to be expected as it details one of the darker moments in human history. 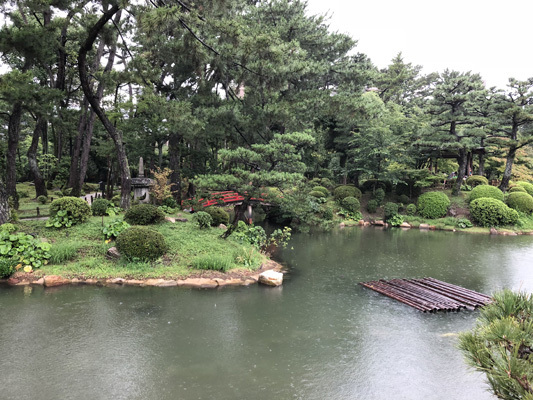 Due to the weather, we were unable to take part in our original plan of taking a boat on the river to Shukkeien Garden. The owner of this company, however, was nice enough to meet us at a cafe near the river to talk about the service. Based on what he said, the trip sounded pretty convenient and fun. Just looking at the various rivers crisscrossing the city was nice, and the day before we had been able to take a different boat up the river to return from Miyajima. 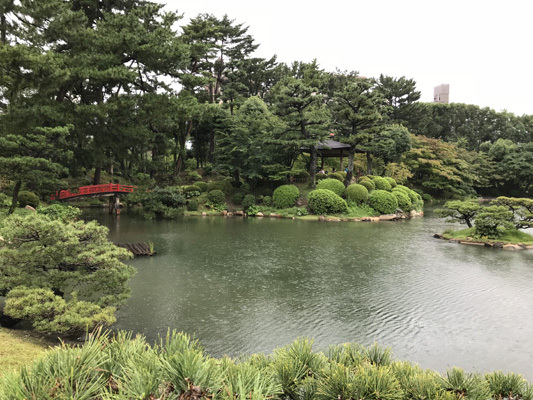 Shukkeien was so pretty that even the rain couldn't detract from it. The inside of the garden was quite stunning, especially the areas around the lake. 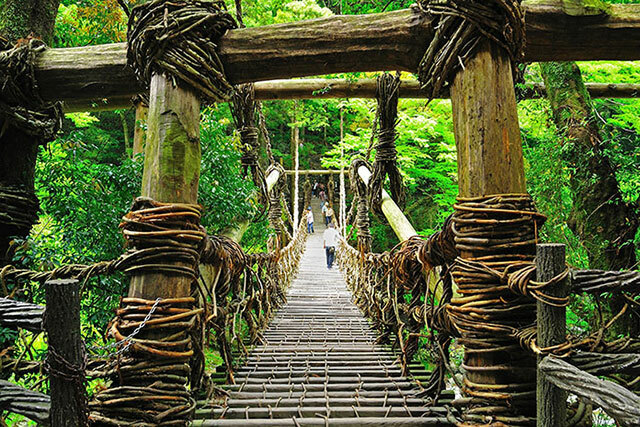 I enjoyed walking on the small bridges and taking in the whole landscape. I was happy to look around the garden, as it was really relaxing and scenic. 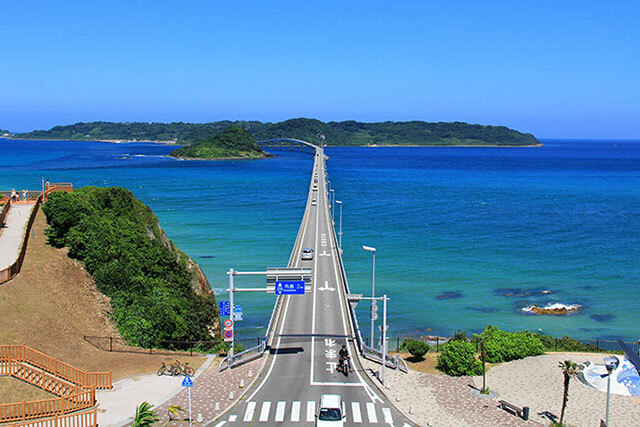 The Shimanami Kaido Cycling Route spans a total length of about 70 km connecting Onomichi City, Hiroshima Prefecture and Imabari City, Ehime Prefecture with six bridges traversing the many islands dotting the area. 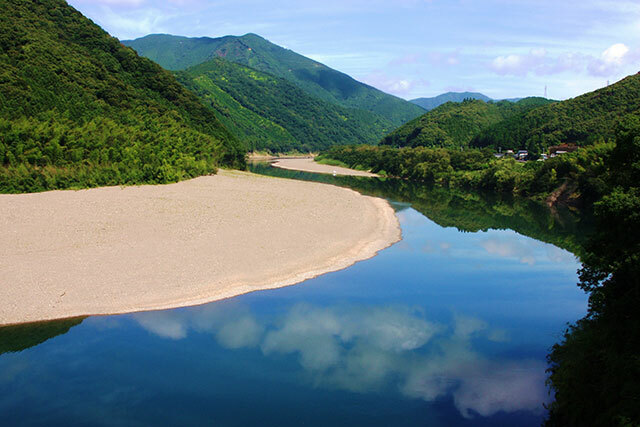 It was selected by CNN as one of the best bike routes in the world. Cyclists can enjoy an exhilarating ride above the ocean while gazing out at it and many islands, which has earned the area the nickname of the "Aegean Sea of the Orient." 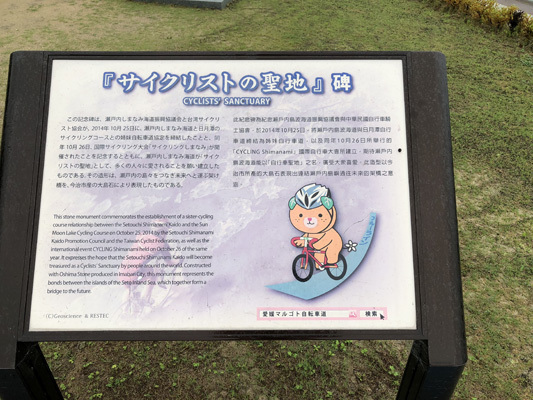 Bicycle rentals are available at shops along the Shimanami Kaido Cycling Route. 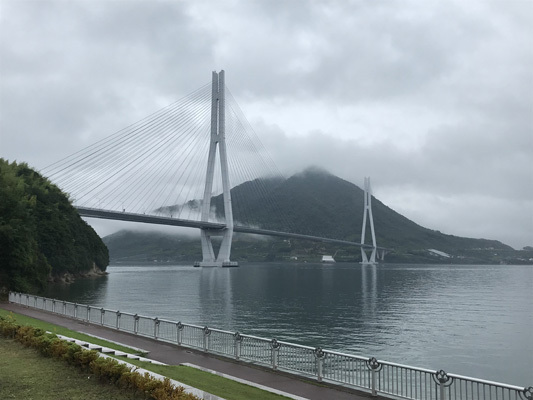 I enjoyed learning about the development of cycling-friendly infrastructure along the shimanami kaido, especially all the bridges connecting different islands to each other. Everything seemed to be maintained in very good condition, with thoughtful touches to make the experience easier for visiting cyclists. 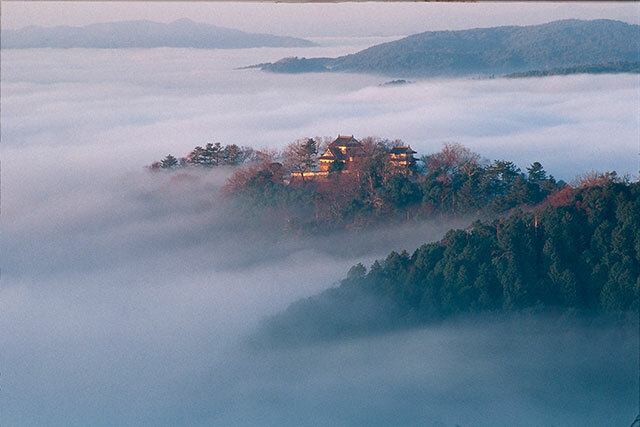 I had never heard of Kousanji and the Hill of Hope before, but it was super cool to visit! 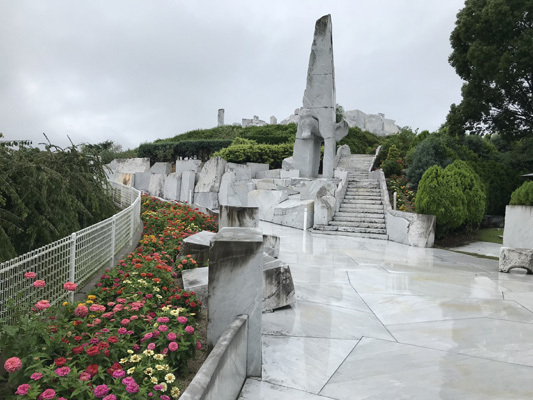 Definitely a neat contrast, with the temple complex and the "tunnel of hell," leading out to the Itto Kuetani's absolutely stunning "Hill of Hope." I appreciated how knowledgeable our guide was about these attractions-- her commentary really added a lot. 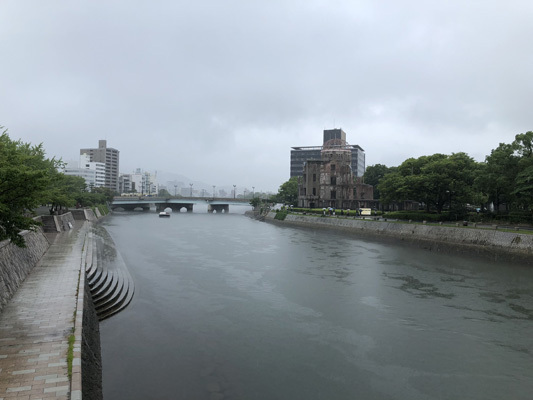 It was too bad that we couln't actually cycle the shimanami-kaido due to the pouring rain, but I appreciated the opportunity to learn about the cycling system and drive around to see what it would've been like. 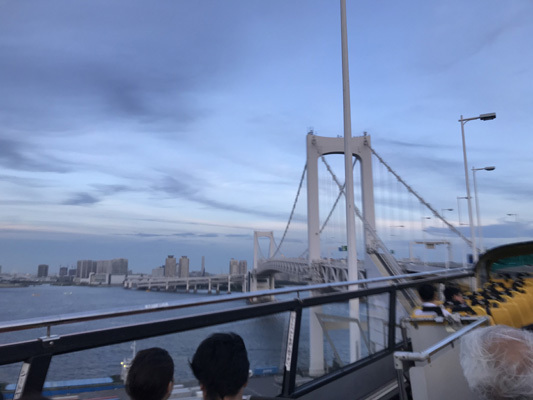 I never knew about the shimanami-kaido, but after visiting on this trip, I really want to go back and actually cycle there. 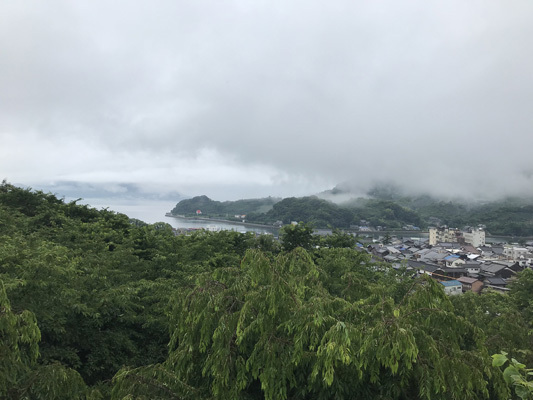 Although the low-hanging rain clouds made it difficult to see out very far, we still got a decent view of the Onomichi channel and the Inland Sea from the Hill of Hope. Because of the weather, we could not cycle on the Setouchi Shimanami Kaido. However, based on walking around places connected to the path and our car trip, it looked cycle-friendly, and we saw some intrepid cyclists, even in the bad weather. And all of the places we stopped including the Setoda Sunset Beach seemed geared toward cyclists. 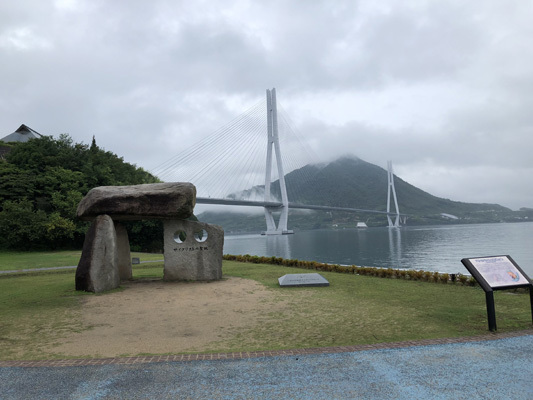 I thought the trip managed a good balance between the three points - historical sites, modern art, and the landscape of the Seto Inland Sea. 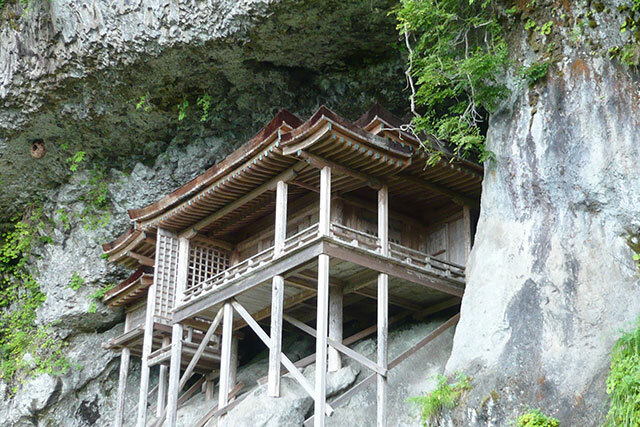 The highlight was definitely Kousanji Temple and the various buildings there. 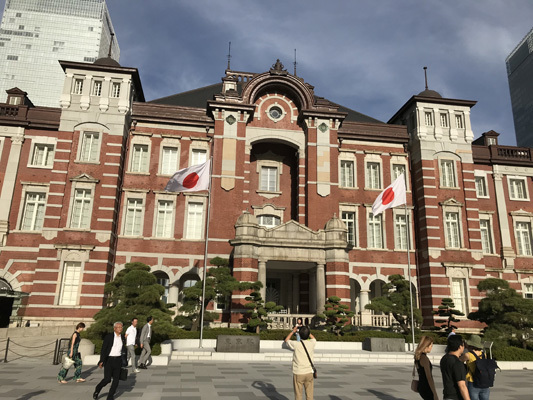 I enjoyed learning about how each of the different structures were inspired by different locations in Japan, and also getting to see the inside of the historic house, which was quite luxurious. 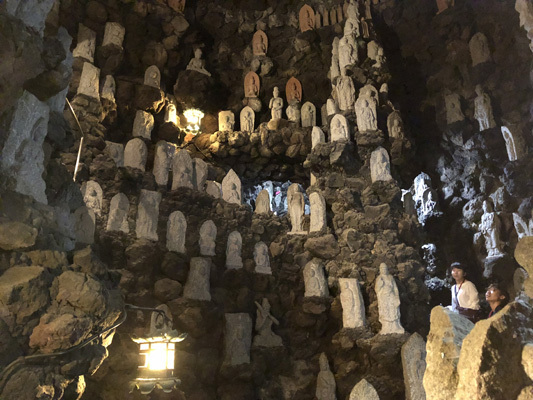 Nothing really topped the Senbutsu Cave, which the many paintings depicting the various levels of hell and the many intricate statues were found deep in the cave. As mentioned, this did not happen because of the rain. Instead, we took a car tour of the road, which was pleasant. I hope to come back to cycle this road. The drive to Onomichi was quite pleasant, and the car ferry ride was an interesting experience. 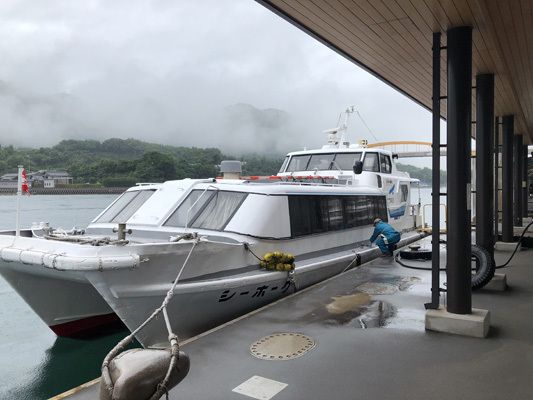 By the time we got to the Onomichi Channel, the rain was coming down harder than before. 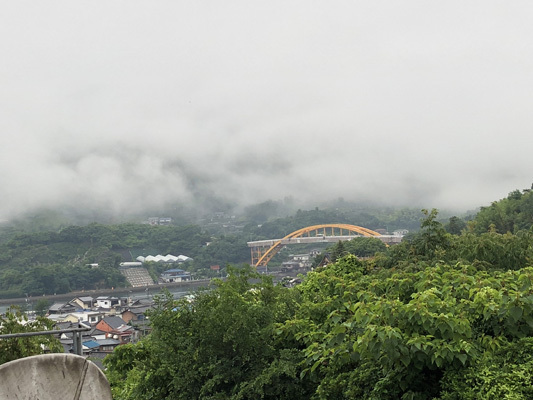 The view of Onomichi Channel would have been great if the weather was nice. Onomichi U2 was opened in March 2014 as an entryway to the Shimanami Kaido, a holy ground for cyclists. 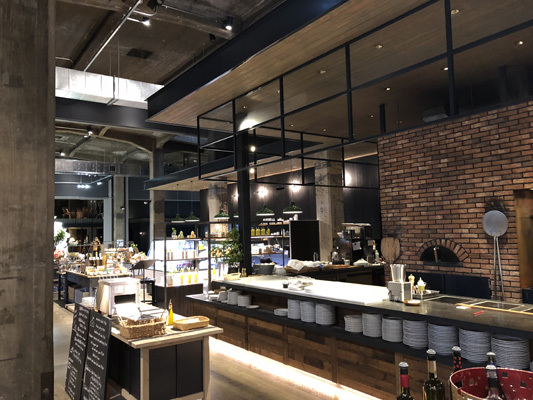 Its stylish exterior was renovated from an old storehouse located along the Onomichi Channel, and it is fully equipped with lodging accommodations, a café, a restaurant, and a bar. There is also a shop where visitors can buy products related to the Setouchi area. 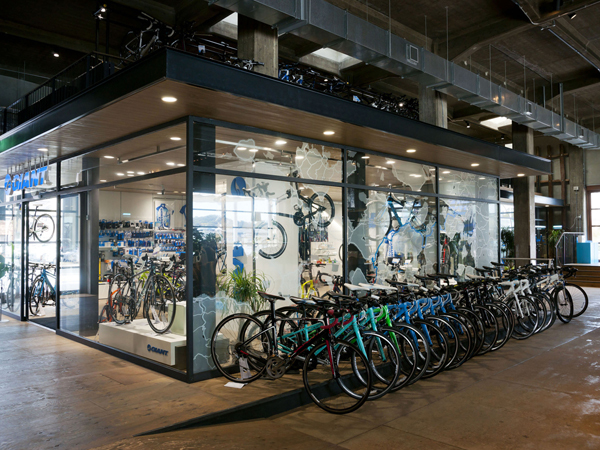 This facility supports a pleasant cycling experience with services such as allowing overnight guests to bring their bicycles to their room after check-in, on-site professional bicycle maintenance staff, on-request bicycle shipping to the desired cycling start point, and even pick-up service for the way home. 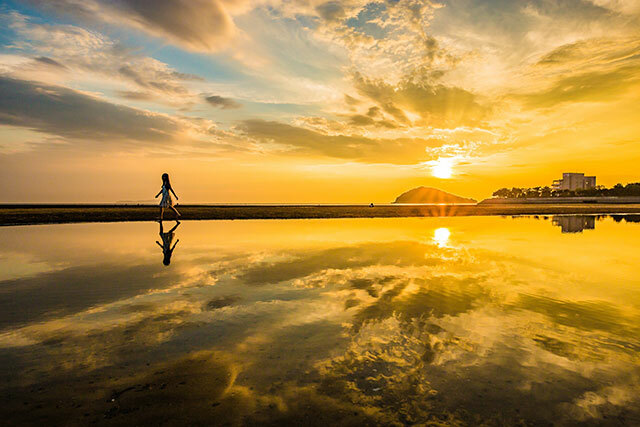 In addition to cycling, feel free to ask the staff about activities to get your fill of the area and other ways to have fun, such as cruises in the Seto Inland Sea and walks in the hills of Onomichi. 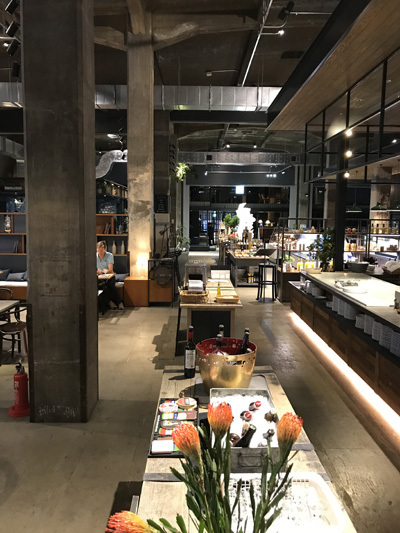 We had a really nice dinner right near the ONOMICHI U2's Hotel Cycle, on the dock. 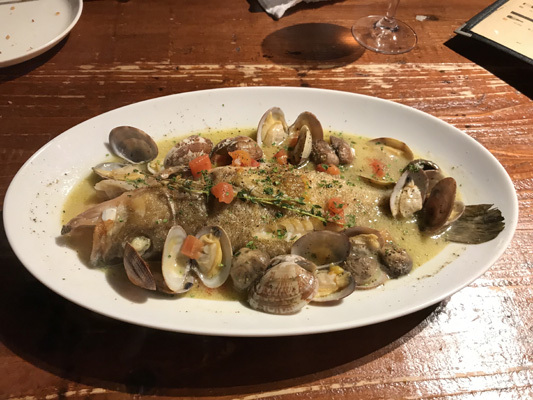 Delicious fresh seafood-- the oysters were some of the best I've ever had! A very cool experience staying so close to the water, too. I loved this hotel, and will definitely recommend it to people! It's definitely great for cyclists, but even if you just happen to be in the area, it's great place to stay. 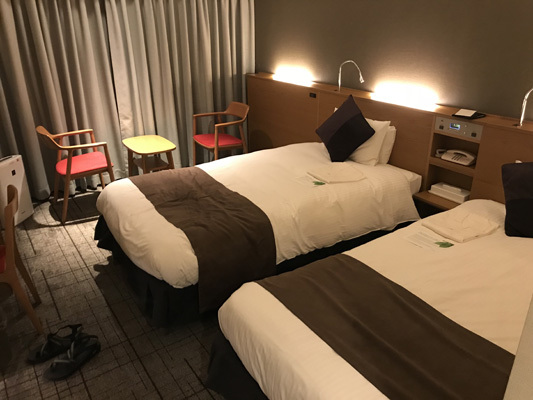 The wide-open layout, modern but comfortable décor, attentive staff, comfortable rooms, great food... top marks on nearly every metric. 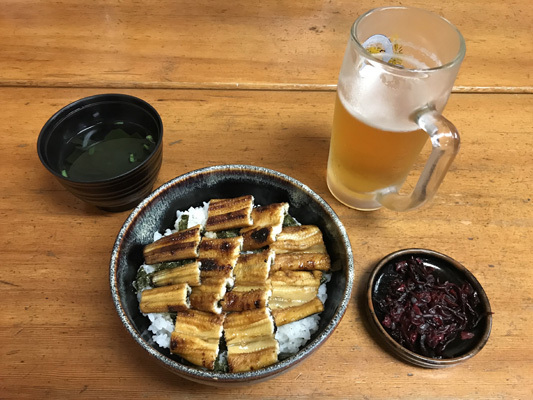 We found a nice restaurant about three minutes away from the ONOMICHI U2. 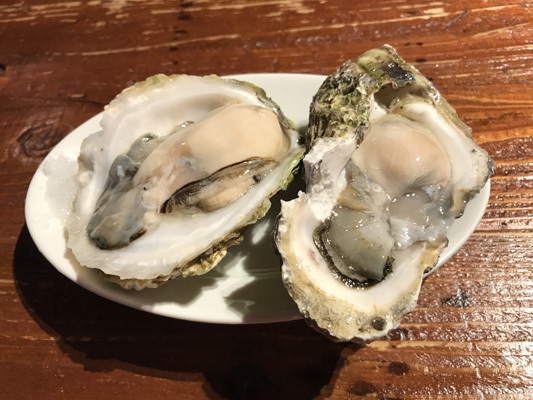 The seafood was delicious, offering a taste of Onomichi that surprised me with its flavor. The oysters, in particular, were a delighｔ. 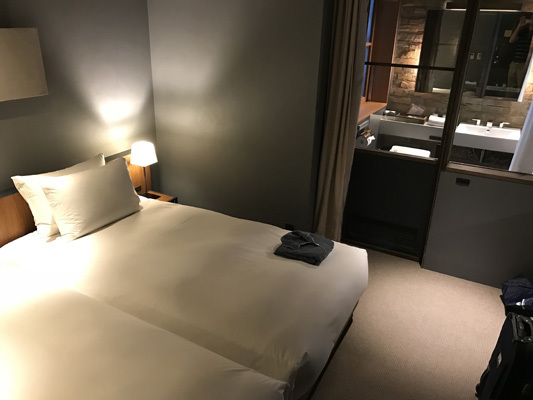 Seeing what appeared to be a warehouse from the outside made me a little curious at first, but the Hotel Cycle at the ONOMICHI U2 was a fantastic place to stay: the hotel delivered on everything. 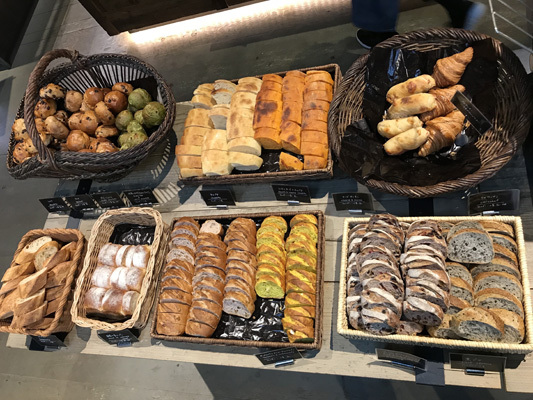 The complimentary breakfast provided in the morning was quite tasty — especially the bread buffet, with the variety and quality being excellent. As a place to stay, it was really fantastic. 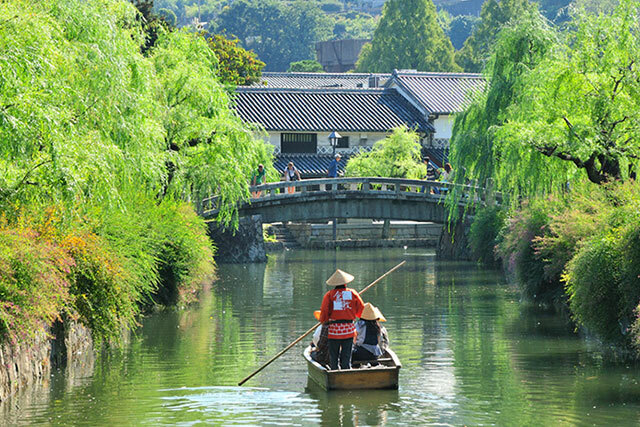 Onomichi City is located on the island of Honshu in Southeastern Hiroshima Prefecture. 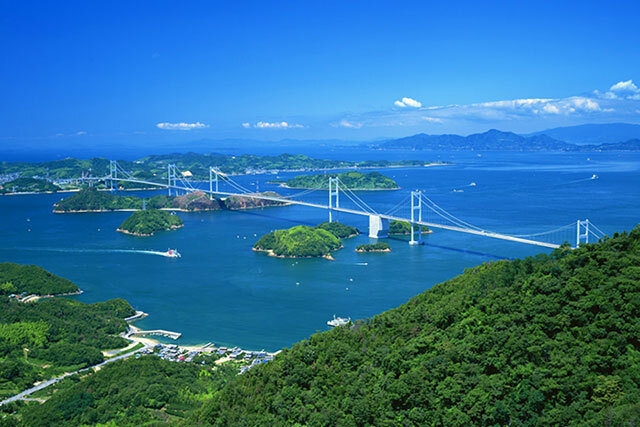 The city also includes the Shimanami Kaido connecting a number of islands in the Seto Inland Sea with Honshu and Shikoku. 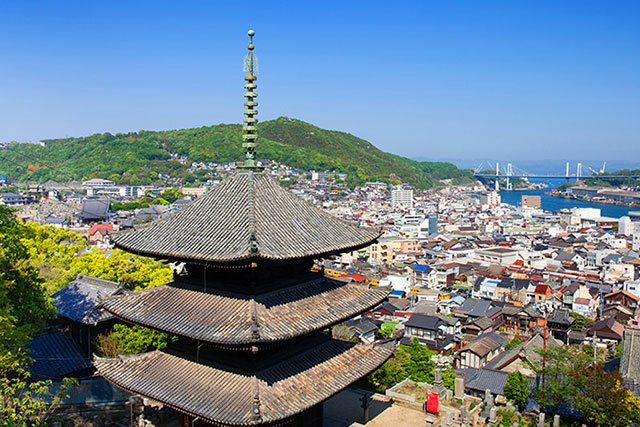 The portion of Onomichi City on the island of Honshu features mountains to the north and the Seto Inland Sea to the south connected to the mountains by a gentle slope with views of the sea. The city has a unique topography with many hills. Its nostalgic ambience as a seaport town has seen Onomichi City used as a backdrop for a number of novels and movies. 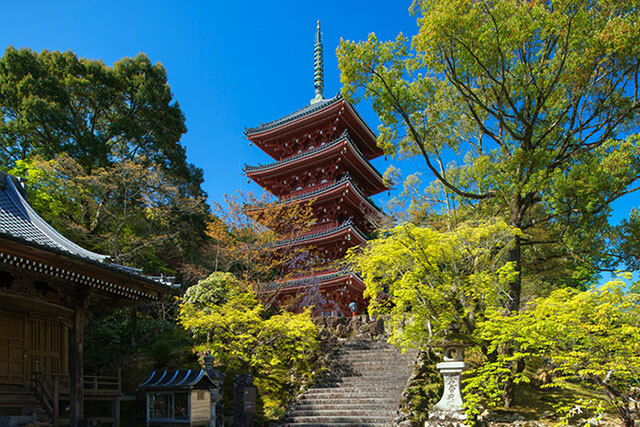 Additionally, Buddhism flourished in this part of Japan, making it a great location for making the rounds at old temples and learning about Japan’s history and culture. 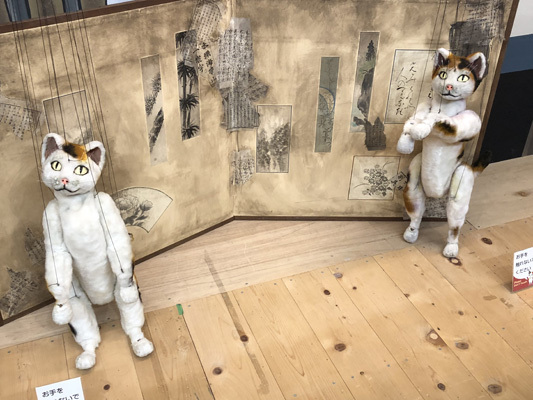 Although it’s a seaport town, Onomichi City is also known as a cat town as well. Visitors are sure to encounter cats just about everywhere they go in the city. There is even the Cat Trail featuring stones with cat engravings, which is known as one of the newer destinations in the city. 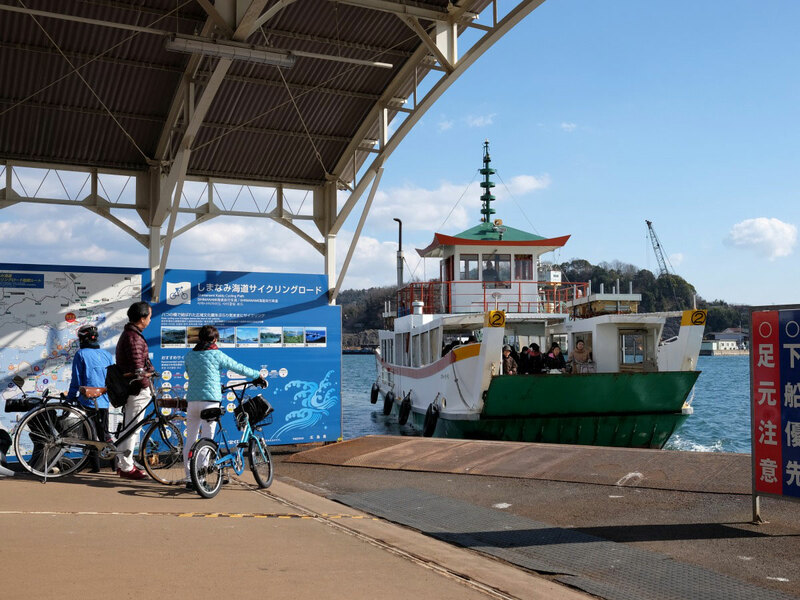 Onomichi City is a popular destination for bicycle enthusiasts because it is the gateway to the Shimanami Kaido, a road known as a bicycling Mecca. We unfortunately didn't get to visit these places due to the pouring rain, but I hope to have the opportunity to go back and experience this. We weren't really able to follow the schedule for the final day due to the rain, but the lunch we had at the Hotel Cycle was wonderful. The aged rump steak was amazing, and the lemon pizza that we ordered was also really good. The trip had a great variety of food and experiences, a very thoughtful mix. 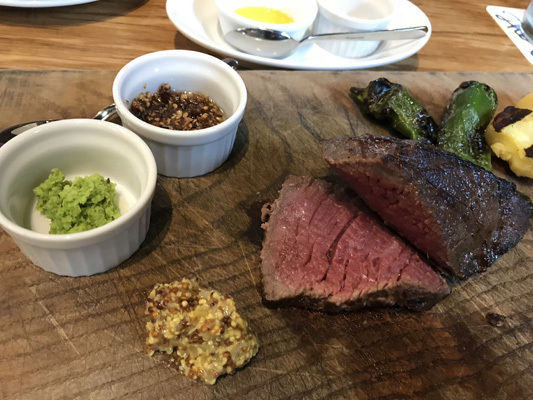 I enjoyed just about everything in terms of food, especially all the things we had in Hiroshima. All the detail that Japanese people put into preparing food is so impressive! 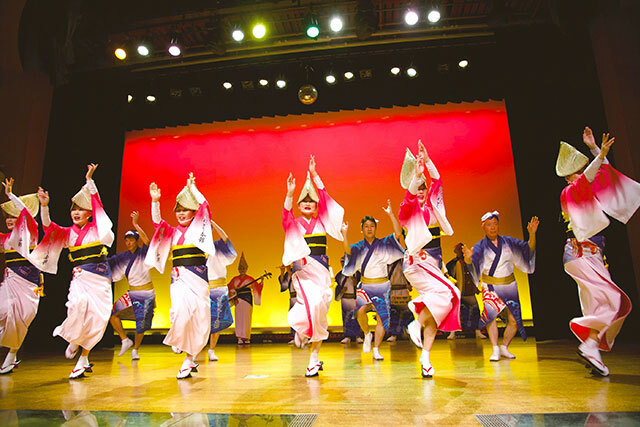 I also really enjoyed the mix of modern and traditional, active and artistic experiences involved in this trip. Again, a very thoughtful balance. The final day of the trip saw the rain intensifying. When I woke up, hotel staff told me our guide would be delayed at least an hour. Soon, they told me the guide couldn't come at all. 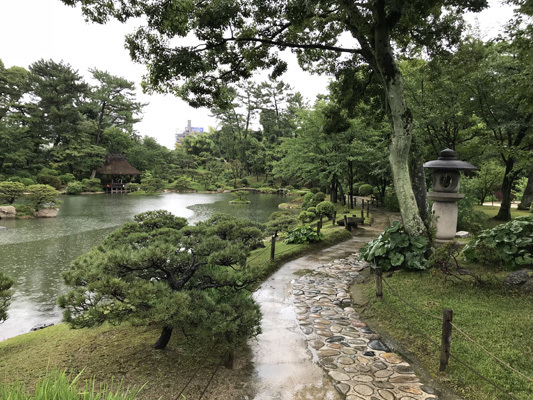 So, our plan to visit the Senkoji and the Path of Literature did not happen, but it is also completely understandable, as the rain was really coming down hard at this point. 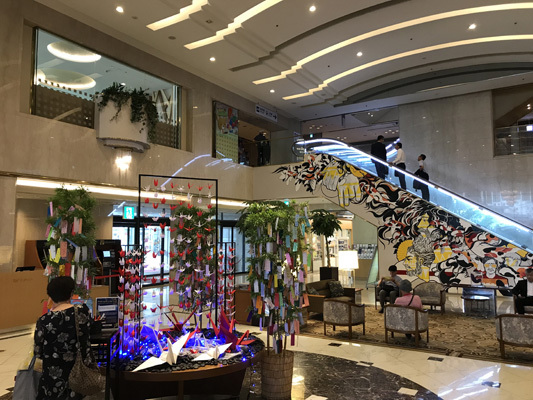 Because of the weather, we spent the morning and early afternoon at ONOMICHI U2's Hotel Cycle. I want to note how great our time here was during this unexpected delay. Staff were incredible and provided us with lunch, which was delicious. 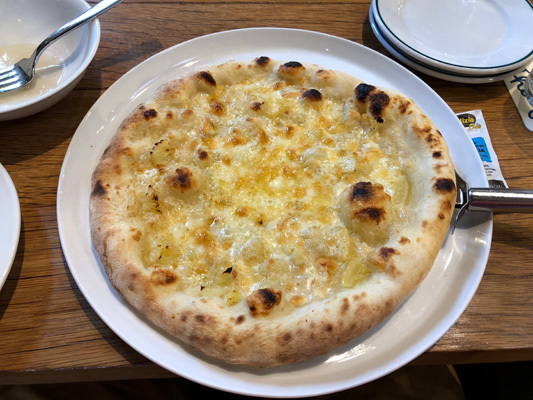 Besides more of the bread buffet, I tried out a lemon pizza; it was fantastic! We didn't have a chance to leave the hotel on the final day, so we didn't see much and only ate at the hotel, but the food was incredible. The guide then arrived at the hotel to drive us to Hiroshima Airport through the rain. Even though the rain made the trip a little bit difficult toward the end, I still had a great time and appreciated our guides' efforts. Now that I've experienced what the Seto Inland Sea area has to offer, I will definitely be back in the future! I thought this was a very enjoyable and informative tour. 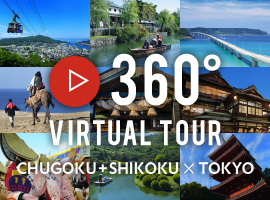 It gave me new perspectives both on the city I live in, as well as Hiroshima and the surrounding region. It was also my first trip to the Seto Island Sea. 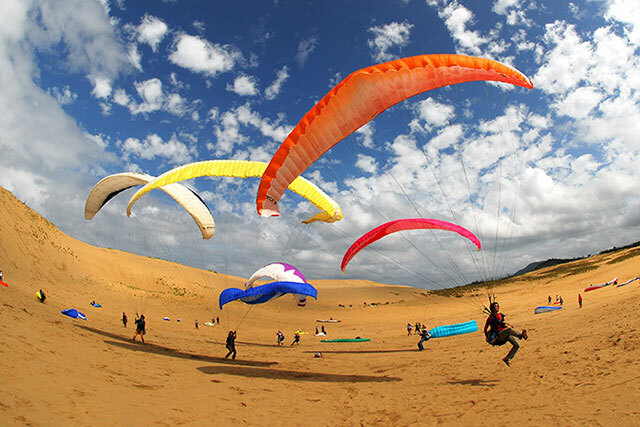 I thought the tour as a whole had the right balance between activities, touching on just enough history and leisure so that neither element overwhelmed. All the hotels were nice and staffed by kind people, and every meal — and snack, for that matter — was a delight. The weather ended up impacting the trip significantly, canceling many of the things we had planned, but there was nothing anyone could do about that, and I think we were able to adjust well. I really liked the tour. I especially enjoyed the time in Hiroshima and the Seto Inland Sea area, as this was a part of Japan that I hadn't spent much time in. Overall, I had a great time! 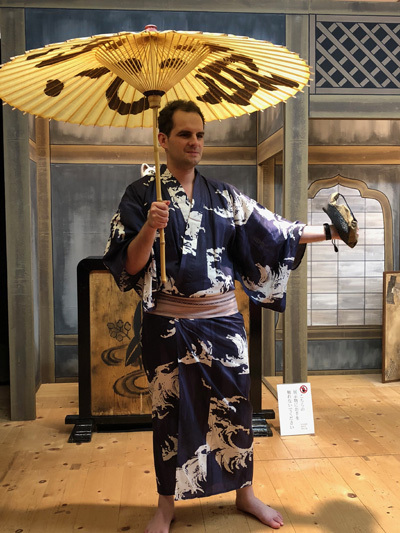 Overall, I liked many things in this tour, with particular highlights being the kabuki museum, Miyajima Island and the U2 Cycle Hotel. I would liked to have had more time at the Atomic Bomb Museum, as it deserves deeper reflection.